As we move forward in a new era in space exploration, driven by private enterprise, resources are set to determine the playing field in terms of enabling humans to eventually live and work in space. The rationale behind this, is that they have the potential to create a viable economic presence beyond Earth. Of course the idea is nothing new; “we are only repeating what has been done throughout history, just in a new environment” explains Chris Lewicki, President and CEO of asteroid mining company Planetary Resources, which was founded in 2009. But it is a concept that has taken a while to be considered seriously by the mainstream. Today, companies such as Planetary Resources are no longer alone as their ambitions are shared with other start-ups, investors and governments across the world. Beyond returning minerals such as precious metals to Earth, the other real value lies in using what is found and mined in space, for exploration itself. Just as oil here on Earth defined the 20th century, the abundance of water elsewhere in the solar system and its many uses, including its potential for rocket fuel could, according to Lewicki “Define the 21st century”. Future space explorers will effectively ‘live off the land’. Instead of relying on bringing supplies from Earth, they will be able to manufacture what is needed, when it is needed, from what is available. It is this ability to use available resources combined with manufacturing in space, which provides a game changer for the way we explore beyond Earth. “We are interested in how people live and work in space, how we become an interplanetary reality” says Spencer Pitman, Head of Product Strategy at Made In Space, a US based company which specializes in the engineering and manufacturing of 3D printers for use in microgravity. Imagine, for example, during the fateful voyage of Apollo 13, the astronauts had had access to a 3D printer. “All of a sudden they had to solve a problem, where they didn’t have a tool” explains Pitman. Of course the technology hadn’t been developed in 1970 and fortunately the outcome was successful, but had they had access to the ability to generate new tools, Pitman believes the story of Apollo 13 could have been very different. 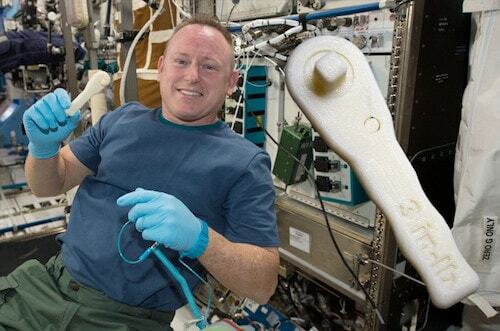 Today, Made In Space have two 3D printers on the International Space Station, the first of which was first installed in 2014, some 44 years after Apollo 13. “The 3D printer on the Space Station is demonstrating resiliency through agility” explains Pitman. When astronaut Butch Wilmore needed a ratchet, the team were able to demonstrate that possibility of creating new tools in space. “We were able to design a ratchet, which took 5 days to be approved by NASA and print it in the space of 2 hours. A week after the request Wilmore had a ratchet he could use.” In the past, as with Apollo 13, astronauts would have to make do with the tools which were available to them at the time. 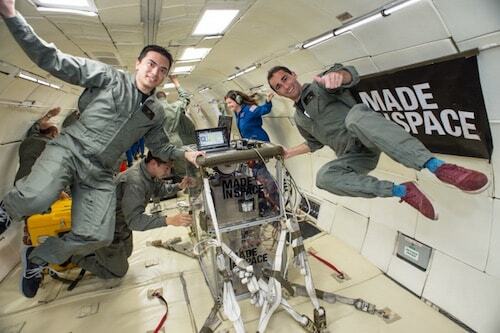 This is just the tip of the iceberg as to why manufacturing in space is so exciting. In space, iron is plentiful, as is nickel and cobalt, but those aren’t the only resources available. “Anything that is solid at a certain temperature is something we can deal with” explains Pitman. “Pure materials, polymers, plastics, we have a set of possibilities in terms of the materials we are interested in developing capacity for – included a range of raw materials in space.” The idea being that a future spacecraft or crew could arrive at a new place and 3D print everything needed to survive, including entire habitats, from the resources available. Whereas for example Made In Space, Planetary Resources, Bigelow Aerospace and spaceflight companies such as SpaceX and Blue Origin might seem like they have very different objectives now, Pitman believes we will see a convergence as we push to explore deeper into space. All have the common goal of progressing humanity’s exploration of space and making human life multi-planetary. As with any new idea or technology, there are many challenges ahead. However, legislation with regards to enabling this to happen now exists. In November of 2015 President Obama signed the US Commercial Space Launch Competitiveness Act, which states that any materials American individuals or companies find on an asteroid or the Moon is theirs to keep and do with as they please. The next goal is to provide maximum certainty for companies and their investors, while implementing the policies. And other counties are now following in Americas footsteps. 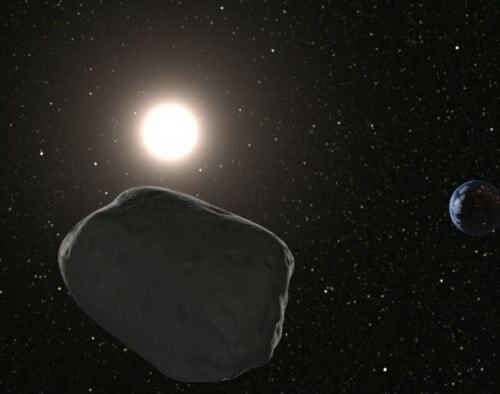 The UAE is expected to soon pass law regarding commercial activities such as mining and in Luxembourg the government last week signed an agreement to work with private space companies to test new technology for space mining. The small European country has shown a great deal of interest in space resources and recently held a conference focussing on the subject with the participation of key entrepreneurial space players such as Made In Space, Planetary Resources, and Space Angels Network. For the layperson these agreements might not seem like they mean much now, but this is a crucial first step for defining how we explore space this century, which will enable space startups and entrepreneurs to create a space future once consigned to science fiction. And technology always has a way of overcoming the challenges. “We are innovating on every level. Our philosophy is test often and if possible, test in space.” says Lewicki. The concept of space resources is audacious and ambitions, but that means there will be solutions created which are really different. “And instead of having to wait all the way until we’re mining an asteroid to make money, we can actually use those technologies to make money along the way.” This pathway will also help improve life back here on Earth. The endeavor by Planetary Resources has already seen the development of multiple transformative technologies for applications in industries such as agriculture and oil and gas, and the technology to 3D print habitats in space could also be used for housing back here on Earth. 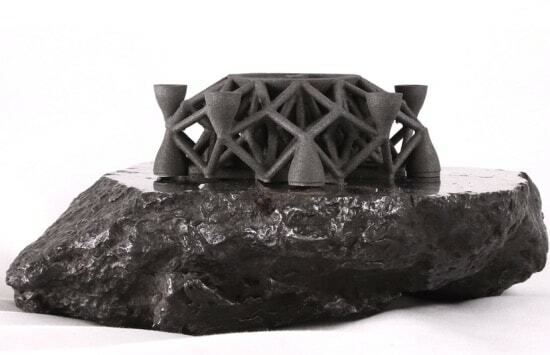 For Pitman, the goal is to get to a point where, “the system of working with space resources is so resilient that we could arrive at a place with new material we haven’t discovered yet and we could figure out how to print with it.” One day, perhaps hundreds of years from now, we would have laid the foundations for a future generation, to do just that; arrive at a new world, one with materials we haven't yet imagined and live off those resources. What is happening today might seem improbable to some, but it really is that first big step in moving our species beyond Earth.